RUSSEL'S BELIEVE IT OR NOT! Picture a beautiful 1,200 seat Roman Catholic Church in a <?xml:namespace prefix = st1 ns = "urn:schemas-microsoft-com:office:smarttags" />Midwest city with very reverberant acoustics. The sound system is a zoned array of several overhead loudspeakers or clusters thereof. Typical of the more modern Catholic and Lutheran congregations, the system consists of an auto-mixed liturgical system and a separate choir sub-system. The choir sub-system and mic console sits adjacent to the Organist, who does double duty as music worship leader and controls his, and cantor/choir microphones and cassette and CD playback. An urgent service call was requested to address a low droning sound over the sound system that would come and go. Of course when we arrived at the church, we were unable to observe or duplicate the complaint! All of the controls were as they should have been, well, that was almost true. You see, inside of the organ console is a sensitive condenser microphone that the organist will sometimes use to lead the musical portions of the services. But the organ console's tambour (read, roll-top) cover was closed. 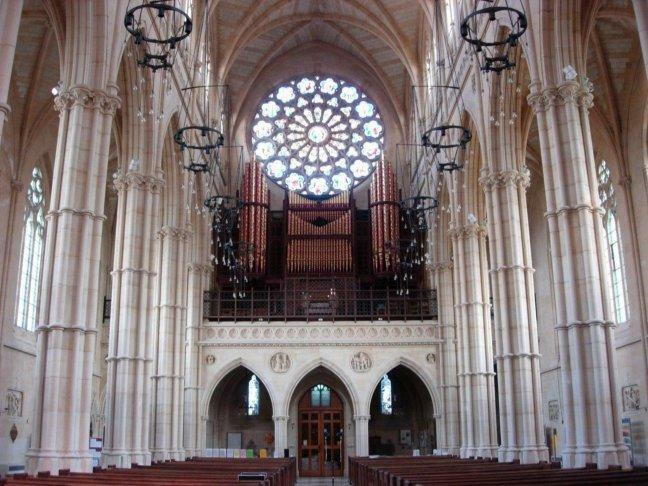 When the organist's microphone was set for slightly higher than normal volumes, and the lid was closed, any slight tapping or bumping of the organ console cover would set off a low moaning sound that would come and go. Normally these controls are all turned down when the organist is finished using the system. This time the guest organist must have forgotten! The moral of this story is that one must expect the unexpected and "know thy sound system!" We were invited to inspect a recently installed sound system in a large traditional <?xml:namespace prefix = st1 ns = "urn:schemas-microsoft-com:office:smarttags" />Baptist Church in Chicago. The issues were the effectiveness of the new sound system installation. Part of which was brought about by the replacement of a significant amount of sound system gear that had taken a lightning strike! There was no as-built sound system documentation. There were no labels on any of the console's input/outputs, amplifier channels etc. The sound system coverage was less than desirable, but it all worked. As we were inspecting the new equipment installation there was a strong odor of overheated electronic components at the mix location. We checked the local AC power receptacles and discovered that the first duplex receptacle had no third wire safety ground connected. A second duplex AC receptacle measured 220 volts from HOT to NEUTRAL and 110 volt from HOT to GROUND AND neutral to GROUND! Finding this wiring mistake could have saved someone from getting electrocuted and in addition,save the sound system gear from becoming toast! This was a time to refer the church to a competent electrician to sort out and rectify the problems which was done the next day!